An exciting new way to organize and access your files! Just click on a folder in any Browser Column and the very next column will be filled with its contents. WinBrowser's Path Scroller shows the selected item's path. Simple. Animate the image on the right to see an example. WinBrowser lets you drag and drop items to the Shelf to bookmark them. Shelves are ideal for organizing and gathering related items or for musicians who want to collect their favorite hits and snares. Create as many as you like. Click on a Shelf icon to navigate there. Drag/drop a Shelf icon to copy or move. Once you start using Shelf icons you'll never go back. Most Windows file managers, like Explorer, rely on a single directory tree to navigate to an item on your PC. Each time a sub-folder is chosen the entire navigation path can scroll drastically out of view. Retracing your path to make a new selection can take an significant amount of searching and scrolling. 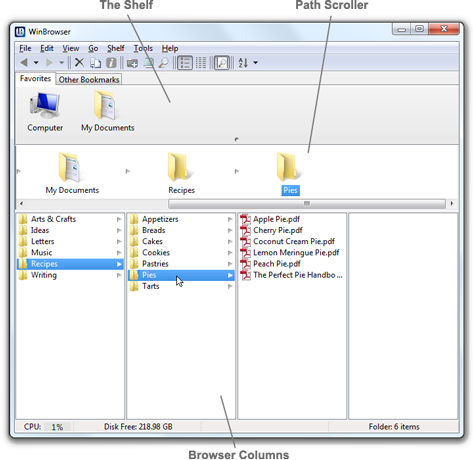 Multi-column file managers like WinBrowser and the Macintosh Finder allow each folder to occupy its own column (also known as a Miller column) so its sub-folders don't get mixed in with all the other displayed sub-folders. The folders stay organized and the path from one to the next remains clear. Macintosh is a registered trademark of Apple Inc.